You can never tell how big or how serious a trend is just from reading it about it in the newspaper, so when Melissa Korn wrote recently in the Wall Street Journal that college professors are increasingly banning laptops from their classrooms, I had to ask, what kind of growth and what kind of absolute numbers are we talking about? Like, two percent? Three guys the reporter ran into at a bar? But I’m intrigued, and maybe even gladdened, if there’s any trend that direction at all, because the more I’ve considered the ways I read, write, listen, and take notes, the less optimistic I am about the role of computers in those activities. For example: I’ve been researching a new novel that takes place in Pennsylvania during the Civil War, and so I’m reading and digging widely — about the war, Pennsylvania German culture and language, the locations where the action occurs, farming practices, and so on. Some of this gets pretty specific: How would you build a fence, from start to finish, relying on your Pennsylvania woodlot and hand tools? What would your mobility be like with an unrepaired ACL tear? I started out from old habit doing historical research using Zotero to take notes, but while traditional formal notetaking practice is great for academic citations and bibliographies, it’s cumbersome if you’re writing fiction and all you need is plausibility. And while the ability to keyword-search a two-year corpus of research is tremendously useful if you’re writing a dissertation or a monograph, most of what I find myself asking comes up as I’m writing and is used almost immediately. Not to mention that if I’m reading a book while I wait to pick up my daughter from dance class, I have to carry my laptop with me. So a few weeks ago I switched to using a bound notebook, hand-numbering the pages, and indexing topics in the front. It’s simpler and more convenient. But it’s also improved my research in a couple of interesting ways. 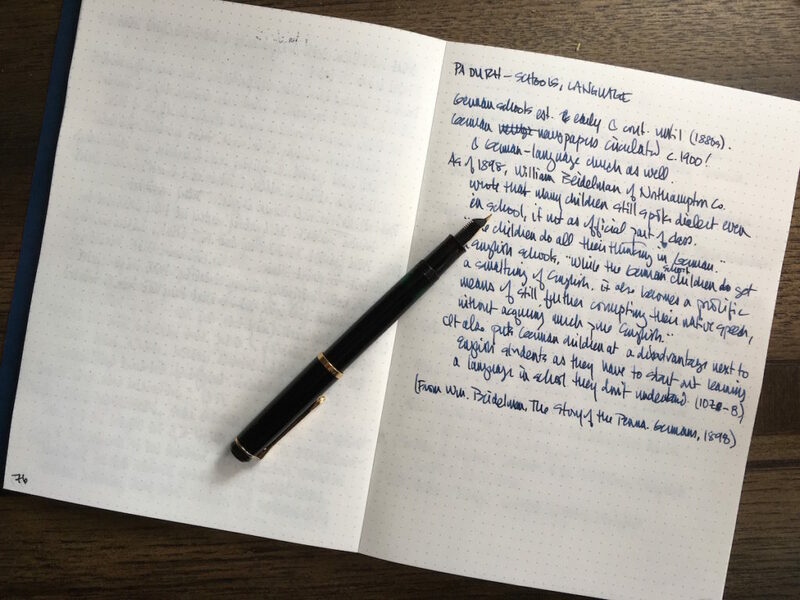 For one thing, when I’m writing (which I do on a laptop, for very different but equally practical reasons), I don’t have to switch to another app to check my notes; I can flip through my notebook on my desk. Why is that better? Because I don’t lose my place in what I’m writing, and I’m not tempted to, say, check my email. The notebook doesn’t shift my focus. This year I’m teaching my daughter physics, and though you might think it would be easy for a guy with a degree in physics to teach eighth-grade physics, it is not. It is undoubtedly easier than it would be if I didn’t have a degree in physics, but that’s not a high bar, you know? Much of physics beyond the most elementary observation is deeply mathematical; you need at least first-year algebra to make any sense of it, and at least a year of calculus to make a lot of sense. And to the extent that there are simple, practical, hands-on ways of exploring deep concepts, I didn’t learn them in college. So, for example, I did lots of fancy calculations of torque but never built a trebuchet, and I learned to analyze the role of a capacitor in a circuit but never built a Leyden jar. Teaching middle-school physics, then, has been an opportunity for me to fill in some rather distressing gaps in my own education, and to think about what I did learn in new ways. To wit: In planning our unit on electricity and magnetism I stumbled across a book called Safe and Simple Electrical Experiments, by Rudolf F. Graf. Since it was published in 1960, “safe” assumes something slightly less than the helicopter parent’s standard of child care, and “simple” assumes a child whose brain has not been squeezed completely to mush by electronic devices: all the better! You have to think to do this stuff, and fiddle with things when they don’t work the first time, and there are delightful instructions on how you can give your friend an unpleasant but allegedly harmless shock. On the negative side, some of what were considered household objects in 1960, such as vinyl records, may not be as easily accessible in 2017. But there are nearly always substitutes if you hunt for them. The stuffed wingback chair in my office puts me at eye level with my woodworking books, which was not deliberate but maybe not entirely accidental either. Last week I noticed a book I’d forgotten I’d bought: The Village Carpenter, written by Walter Rose in 1937, a memoir of life as a carpenter in an English village in the late nineteenth century. There’s a great deal here that interested me, both as a woodworker and as a rural historian, and I may have more to say about it later, but what struck me most was the relationship Rose describes between the workers, their methods of work, and their tools—the ecosystem of the craft, you might say. Several years ago, as I tried to get back into serious woodworking, I realized that if I was going to continue I was going to need to sharpen my saws, which were a decade or more old and growing too dull to use effectively. But I couldn’t find anyone who could sharpen a handsaw for me, and I knew I wasn’t going to figure out how to do it from books and videos alone. So I took a class on sharpening hand saws, and I dutifully took along my old, dulled crosscut saw for practice. It turned out that my old, dulled crosscut saw could not be sharpened. “Modern” saws of the sort sold by big box home centers are made of steel tempered too hard to be sharpened with a steel file. They’re designed to stay usably sharp for a long time… and then to be thrown away and replaced. I have a new microwave, or rather I have an old microwave that is new to me. I don’t like it. It is bigger and more powerful than my old microwave. I didn’t need a bigger and more powerful microwave, but I don’t object to the size or the power. Actually I wasn’t entirely convinced I needed a microwave at all; I use it for very few things. Mainly I defrost meat, because I am good at putting together dinner on the fly but bad about planning ahead; and soften butter, because my daughter likes to bake, but, well, ditto. I don’t like this microwave because it has too many single-use buttons and multi-step programmed procedures and not enough basic flexible options. I don’t mean that it is too complicated as such, because some tools have a lot of functions and thus need complicated means of interaction. The problem is that its interface is far more complicated than it needs to be, and sufficiently complicated that its design actually interferes with intelligent use. Here’s an example. If I wanted, with my old microwave, to soften a stick of butter to cool room temperature, I could simply “defrost” it for about 20 seconds. I had only to lower the power and set a time. On the new one, there isn’t a simple way to lower the power; there are only options for various specific foods and purposes. So I have to press “soften/melt,” then watch a scrolling digital readout asking me to press a number for whether I’m softening or melting, and then another number for what sort of food item I have, and then a third for how many sticks of butter. The old process required me to press four easily readable buttons (defrost, 2, 0, start) and worked perfectly, because I’d experimented a bit to see how long it took to soften a stick of butter. The new process takes a good ten seconds to get started and halfway melts the butter, so that I have to stand and watch it through the (typically streaked and greasy) glass. And if I want to soften half a stick, I’m out of luck. Same for defrosting less than a pound of meat. It simply isn’t an option. And while there may be some way to make the machine do what I want, I’ll have to find a manual somewhere online to figure out how, because the “custom” settings aren’t. Originally published at Front Porch Republic. This spring I had to buy a new coffee mill. Facing the loss of both my electric coffee grinder and my antique hand-cranked mill, I debated about what to buy. The decision was no small matter—nothing like choosing, say, a brand of toothpaste or a college major. Making coffee is the first thing I do when I get out of bed in the morning. Well, all right, after letting the dog out. And pulling on some semblance of clothing. But it comes before shaving, shower, morning prayer, checking email on my phone, and any other actually constructive or productive activity. Inconsequential as the ritual may seem, making coffee sets the tone for the day. Not drinking coffee, mind, but simply preparing it. It’s worth mentioning that I gave up on automatic coffee makers several years ago, when a hundred-dollar machine quit working just eight months after I’d bought it—this, the replacement for another hundred-dollar machine that lasted only a year and a half. Possibly I have some responsibility to grease the wheels of the Great Economy, but not that much. Now I do what foodies call “manual drip”: set a three-dollar plastic filter basket on top of my mug, put the filter and grounds in it, boil water in a kettle, pour the water through the grounds, and there’s coffee, better than came out of any machine I ever owned, becaue the water is always the right temperature. And in my old house, served by electric lines that meandered through a half-mile of woods from the highway, to rely on the power company for anything so essential as coffee was an act of purest optimism, because if storms didn’t knock out the lines every couple of months, a squirrel might commit suicide by transformer. Transcranial direct-current stimulation (tDCS) is a promising technology in the field of sleep efficiency and cognitive enhancement. Alternating current administered to the dorsolateral prefrontal cortex through the thinnest part of the skull has beneficial effects almost as mysterious as electroconvulsive therapy (ECT), its amnesia-inducing ancestor. Also known as ‘shock therapy’, ECT earned a bad name through overuse, epitomised in Ken Kesey’s novel One Flew Over the Cuckoo’s Nest (1962) and its 1975 film adaptation, but it is surprisingly effective in alleviating severe depression. We don’t really understand why this works, and even in today’s milder and more targeted ECT, side effects make it a last resort for cases that don’t respond to drug treatment. In contrast to ECT, tDCS uses a very mild charge, not enough directly to cause neurons to fire, but just enough to slightly change their polarisation, lowering the threshold at which they do so. Using a slightly different technique — transcranial magnetic stimulation (TMS), which directly causes neurons to fire — neuroscientists at Duke University have been able to induce slow-wave oscillations, the once-per-second ripples of brain activity that we see in deep sleep. Targeting a central region at the top of the scalp, slow-frequency pulses reach the neural area where slow-wave sleep is generated, after which it propagates to the rest of the brain. Whereas the Somneo mask is designed to send its wearers into a light sleep faster, TMS devices might be able to launch us straight into deep sleep at the flip of a switch. Full control of our sleep cycles could maximise time spent in slow-wave sleep and REM, ensuring full physical and mental benefits while cutting sleep time in half. Your four hours of sleep could feel like someone else’s eight. Imagine being able to read an extra book every week — the time adds up quickly. The question is whether the strangeness of the idea will keep us from accepting it. If society rejects sleep curtailment, it won’t be a biological issue; rather, the resistance will be cultural…. Such attempts are likely to meet with powerful resistance from a culture that assumes that ‘natural’ is ‘optimal’. Perceptions of what is within normal range dictate what sort of human performance enhancement is medically acceptable, above which ethics review boards get cagey. Never mind that these bell curves have shifted radically throughout history. Never mind that if we are to speak of maintaining natural sleep patterns, that ship sailed as soon as artificial light turned every indoor environment into a perpetual mid-afternoon in May. My main thought on all this horror over “pink slime” is that it doesn’t sound any worse than any food-like product I’d expect to come out of a factory. I mean, what do you expect? The goal of the U.S. food industry is to produce substances that are chemically compatible with the maintenance of human life and that are aesthetically and culturally palatable to American consumers, all at the greatest possible margin of profit. Pink slime, duly flavored with extracts, shaped into a patty, topped with half the contents of the refrigerator and eaten by a model with juice dribbling down her chin, pretty much nails it.